Barcelona is one of Europe’s most visited cities, thanks to its architecture, history and good climate. However, it is also a city that is suffering from its own success as a tourist destination, as protests against overtourism, Airbnb and tourist apartments showed. What do the different city rankings say about Barcelona’s success? Think back briefly to Barcelona just post-Franco – a city of grime, crime and sleaze, shaped much in the public imagination by Jean Genet’s A Thief’s Journey. Then its astonishing re-emergence triggered by the Olympics of 1992. It rediscovered its confidence and we discovered its unique design, art and urbanity. It was a model of urban reinvention and edgy distinctiveness and it seemed to exude a special Catalan imagination and creativity and this identity gave it some drive and energy. Yet the influx of outsiders helped too. Barcelona has been compelling and popular if not too popular and now it wants to retrench. It has a different problem for its creativity as mayor Ada Colau seeks to recapture the city for its citizens. What innovative ways will she invent to curtail gentrification pressures, to get the best from the city’s tourists and still maintain its cutting edge feel? How well is Barcelona doing in terms of sustainability? Barcelona has strong social capital and does well in this dimension of sustainability. However, its environmental and economic resilience still have a long way to go to be considered as a global leader in sustainability. In 2016, Arcadis Sustainable Cities index ranked 100 global cities on three dimensions of sustainability: people, planet and profit. Barcelona was given 24th position in the overall ranking. The three pillars represent social, environmental and economic sustainability and offer an indicative picture of the health and wealth of cities. Barcelona ranked high (13th) on the people sub-index which measures social performance and aspects such as life expectancy, education, crime and living costs. However, the city’s ranking on the planet sub-index that captures ‘green’ factors like energy, pollution and emissions was lower – 23rd. Finally, the profit sub-index that assesses the business environment and economic health of the city left Barcelona on an even lower, 43rd position. The profit sub-index considers aspects such as transport infrastructure, ease of doing business, tourism and employment. Even though Barcelona’s travel and tourism infrastructures are well developed, high rates of unemployment and inflexible economic development policies keep the city’s overall evaluation in the profit sub-index low (note: this is the first year that Barcelona was included in the study, so a yearly evolution cannot be shown). 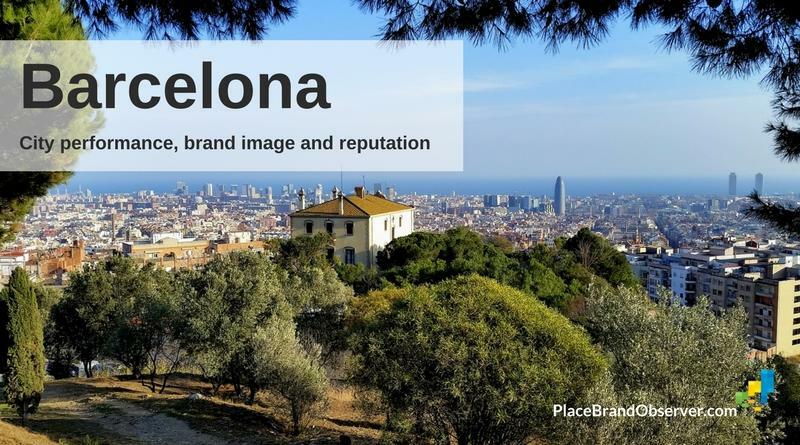 Is Barcelona’s reputation helping it attract new businesses and talent? City RepTrak is a global survey which ranks the world's most reputable cities based on levels of trust, esteem, admiration and respect. In the 2017 edition Barcelona ranked 8th among the 56 most reputable cities. The survey is based on consumer ratings that are grouped into three dimensions: advanced economy, effective government and appealing environment. The best performing cities are those that show excellent ratings in each dimension.